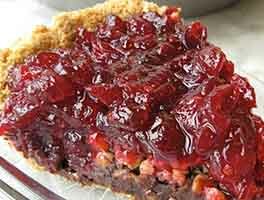 This flexible combination of fruits, possibly including apple, rhubarb, blackberry, raspberry, strawberry, and blueberry, is often referred to as "bumbleberry" pie. We love to combine all the leftover frozen berries from last summer's harvest, and jumble (bumble) them up into one tasty pie filling: bumbleberry. Feel free to use this filling in a traditional double-crust pie. 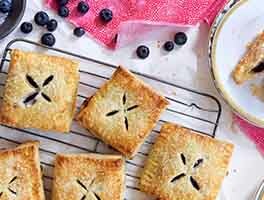 But we love to showcase the berries' vibrant colors by placing them in an oversized bottom crust, then bringing the edges up to partially cover the berries, while leaving the center of the filling uncovered. 1 hrs 40 mins. to 1 hrs 55 mins. To make the crust: whisk together the flour and salt. Add the shortening, mixing until thoroughly combined. Dice the butter into cubes or cut into small pats, and work it into the dry ingredients to make an unevenly crumbly mixture. Mix in 4 tablespoons of the ice water. Continue to add water, mixing as you go, until the dough starts to come together. Add another 1/2 tablespoon of water, and scrape the dough together with your hands. Grab it in one ball; if it holds together nicely, with no dry parts breaking off, it's good to go. If it still seems a bit dry, add ice water by the teaspoonful until it's cohesive. Place the dough on a floured work surface, and shape it into a rough disk. Roll the disk on its edge, like a wheel, to smooth out the edges. This step will ensure your dough will roll out evenly, without a lot of cracks and splits at the edges later. Wrap in plastic and refrigerate for 30 minutes before rolling. While the dough is chilling, preheat your oven to 400°F, and make the filling. If you're using frozen berries, place them in a microwave-safe bowl, and heat them briefly in the microwave, just until they're thawed. Combine the berries with the sugar, thickener, cinnamon, and lemon juice, stirring to thoroughly combine. Roll the pie crust into a 13" to 14" circle, with the edges a bit thinner than the center. Lay the crust into a 9" pie pan at least 1 1/4" deep. 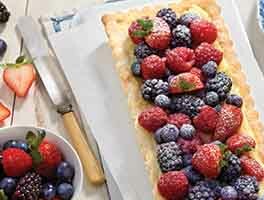 Spoon the berries into the crust. Bring the crust up and over the berries around the outside, giving it a few pleats so it settles nicely. There should be a 4" to 5" circle of uncovered filling in the center. Brush the crust with milk and sprinkle with coarse white sparkling sugar, if desired. Place the pie pan on a parchment-lined baking sheet to catch any potential spills. Bake the pie for 35 minutes on the bottom rack of your oven. Transfer to an upper rack, and bake for an additional 10 to 15 minutes, until the crust is nicely browned and the filing is bubbling. Remove the pie from the oven, and allow it to cool completely before serving; this will take several hours. You may serve the pie warm, but the filling will be very loose, and the slices messy; best to let it cool, then reheat each serving very briefly in the microwave, if you want warm pie. Can you use all butter in the crust? Absolutely. We like the added flakiness afforded by the butter/shortening combination, but substituting 2 tablespoons cold butter for the shortening is just fine. How about turning this into Cape Cod Bumbleberry Pie? Substitute fresh or frozen cranberries for half the berries in the recipe. Increase the sugar to 3/4 cup (which will yield a tart pie; add an additional 2 tablespoons sugar for a sweeter pie). Additionally, increase the Pie Filing Enhancer to 1/3 cup (or the flour to 1/2 cup). To make "pie in a jar:" Double the crust recipe, and use a 2" biscuit cutter to cut 2 dozen rounds. Bake the pastry rounds in a preheated 400°F oven until golden brown, about 15 to 20 minutes. Cook the filling on the stovetop until the berries have softened and the mixture thickens a bit. Place one baked pastry round into the bottom of each of 12 4-ounce mason jars; this will be the pies' bottom crust. Spoon the hot filling over the crusts. Top with the remaining crusts. Serve warm, or at room temperature. Store leftovers at room temperature, with the jar lid screwed on for freshness. For step-by-step photos, see our blog, Flourish. It was very easy. I've been making too many pies this week (pie day) and I was over making them with one more fruit pie to make. I liked the fold-over crust for ease of making and combo of frozen berries because I usually have a variety (this one I used about 1/3 frozen wild blueberries from Costco left frommy handpies, about 1/3 mixed rhubarb and cranberries I froze last year, the rest yellow sweet cherries likewise put up). I usded clear gel because cherries according to the chart and it looks very firm. It's sitting overnight and I hope when I cut it tomorrow it will stay forkable. 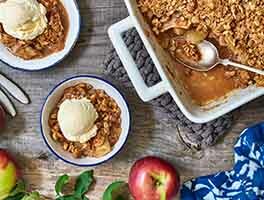 I might just start to make this for a casual weeknight dessert instead of the cobbler I usually make with my frozen fruit. It was that quick and easy. Simple ingredients yet very flavorful. It was absolutely delicious and I will make it again for sure. I used fresh berries and made a latice top crust. Next time I'd like to try this recipe with mini pies and see how it works. I made this pie 2 weeks ago with frozen strawberries and frozen blueberries. I used the fold over crust because crust is one reason I NEVER make pie. It was utterly delicious! I was so proud. I left out the cinnamon because I only like it in certain things. I will make this one again and again. Going to make this pie. Looks great. Should I add the thickening also or just your pie enhancer? I went exactly by the recipe and the pie was wonderful. I will make again. 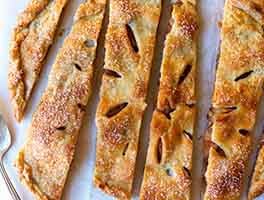 This type of pie crust is called a "galette" and is deserving of its own searchable classification on the site. People who are expecting a classic American pie would appropriately be disappointed, as it is intended to be different, and it is. The lack of form during baking allows a broader, and sloppier, experience, along with a different consistency due to the lack of form. 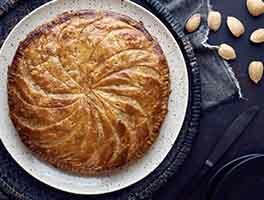 However, it is ideal in that it is essentially a large tart, and goes well with berries and most other fruits. If you tried this with something like pumpkin though, you would likely be frustrated and think it was the worst idea ever. This pie turned out well. I used a frozen berry mix. Mixed the filling ingredients and let sit for 20 minutes, then cooked on stovetop to thicken. The filling is good because it's not too sweet. I made an all butter crust. The edge of my crust seems to flatten during baking. Shortening probably would give the crust more structure.